Breathing is an activity that may be necessary for respiration in aerobic exercise. By breathing you may be able to stay alive. Many of those who breathe describe it as a rewarding experience, since they are able to sustain their life through this activity. This guide is designed for beginners and will not instantly make you an expert, but will provide a basic introduction you to the complex art and science of breathing. Important note:If you are under the age of 18, you should have a responsible adult supervise you. Please consult a doctor before beginning any exercise program. Failure to do so may cause brain haemorrhaging. And please don't sue us. 1.1 Why do I also need a brain? I don't have one! 1.2 I am dead. What do I do? 3.1 Argh! I CAN'T DO IT! 6 I can breathe, now what? In order to breathe you must be aerobic. For example, if you are a Clostridium botulinum bacterium and are anaerobic, it is not recommended that you attempt to breathe, but we congratulate you on being the first of the bacteria to be able to read English. If you are a yeast fungus, do not try to breathe. You should try fermentation instead. Also, this guide was not written for underwater breathing. If you are a fish, we apologize. We also assume that you are anatomically at least somewhat similar to a human. a trachea, a pharynx etc. Basically, you need a working respiratory system. In addition, you must be alive. It is very important that you are currently alive. Since we assume that you are anatomically at least somewhat similar to a human, make sure that you are in an area with plenty of oxygen. The Earth's atmosphere, although mostly nitrogen, is sufficient. Do not try to breathe with pure nitrogen. It will have no effect. Inhaling large amounts of carbon dioxide may result in asphyxiation. Remember, if you do not have any oxygen, breathing is by and large pointless. Check around for open containers of V.X. nerve gas, or pairs of bare, unwashed feet before you try to breathe. If you find such containers or feet, do not attempt to breathe. Rapid unconsciousness and death have been reported by beginners who failed to check for the presence of nerve gas or smelly feet in their immediate vicinity. Death can be a serious setback if you're attempting to breathe. Why do I also need a brain? I don't have one! While it was previously held that you needed a Brain in order to breathe, recent advances in Technology have made this necessity a thing of the past, with many formerly 'unbrained/unbreathed' now partaking in the many dubious pleasures of breathing. The unbrain, I-breathe technique is a spin off of the ever poular I-zombie program where 'Organism Language programming' recorded in MP3 format is used as a replacement for the human brain by providing a continous stream of instructions to the unbrained body, allowing them to carry out simple tasks, thereby providing useful services to society in general. During development of the I-zombie programme it was found that some of the unbrained were so unintelligent as to be incapable of even simple reflex actions unless a breathing subroutine was also included in the play list. While this subset of the unbrained are still only limited to simple duties, they do fill many valuable roles (such as Politicians, Bureaucrats, crash test dummies and CEOs of large companies) which are otherwise shunned by the less unintelligent. Having said this however, if you do not currently possess a brain and the I-zombie program controlling your body does not currently include the Breathing subroutine then you will need to seek the assistance of a brained friend, colleague or family member for assistance to add the breathing sub-routine to your play list. I am dead. What do I do? We are sorry. This guide is unable to help you. You can, nevertheless, try to become a zombie, At this stage, the T-virus would be the most effective in aiding you. Fig. 1 - A diagram of a diaphragm. First of all, you should know where all your organs are. If you are a human, your lungs should be behind your ribcage and your diaphragm should be at the bottom of your ribcage. Your nose should be located above your mouth. If you have trouble locating these components, try consulting an expert. Please make sure that your central nervous system is properly connected to your diaphragm muscle and that your brain is set up properly. If you do not know how to check this connection, please consult your owner's manual. If your owner's manual is lost, missing or temporarily misplaced, dial the help hotline. The help hotline was affixed to your umbilical cord at birth, much like the warning stickers on cords of household appliances. Do not give up yet! After you succeed in detecting the necessary organs and ensuring their proper connection, you will be ready to proceed to the next step. Fig. 2 - Air goes into your nose. If you are ready, you may now try to inhale. Make sure that you are really ready (see redundancy). Do not rush. Take your time. Slowly contract your diaphragm. Air should now begin to flow through your nose into your pharynx, trachea, lungs etc. When you have contracted your diaphragm for 1-3 seconds, you should procceed to the next step. Do not try to only inhale and not exhale or you may explode. This is a common mistake that many beginners make. Do not stop here. Knowing only how to inhale will get you nowhere. Complete the whole guide. You can do it. Success comes in cans, not cannot, can'ts or bottles. Argh! I CAN'T DO IT! Don't be mad! Be glad! Fig. 3 - Air goes out of your nose. Now you may try to exhale. Slowly relax your diaphragm muscle. Do not proceed too quickly. Air should now come out. Congratulations! You can breathe now! To celebrate your great achievement, you should go outside and scream, "I CAN BREATHE!!!!!!!!!!" to demonstrate your great superiority over your species. If you don't succeed at first, try again, and then try again and again and again and again and again...until you go insane and have to be kept in a mental hospital. 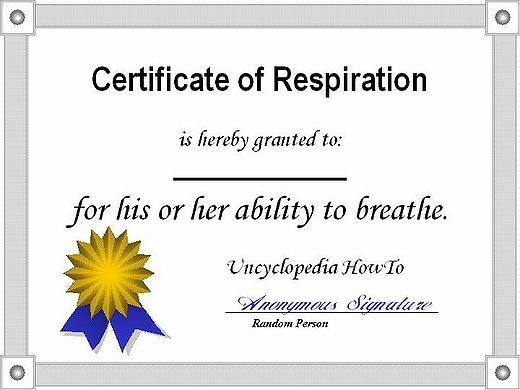 Now you can print out certificate to demonstrate your ability to breathe! I can breathe, now what?